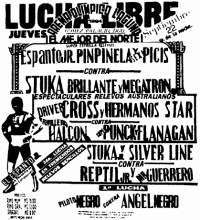 3) Mr. Guerrero & Súper Punck vs El Reptil & Reptil Jr.
4) Atlantico & Silver King b Bronco (Monterrey) & Nuevo Huracán Ramírez Jr.
4) Atlantis, Rayo de Jalisco Jr., Último Dragón b Black Magic, Emilio Charles Jr., Miguel Perez Jr.
1) Flanagan & Súper Punck vs Bala de Plata & Stuka Jr.
5) El Hijo Del Santo & Octagón vs Blue Panther & Espanto Jr.
Vampiro's title vs Pierroth's mask. 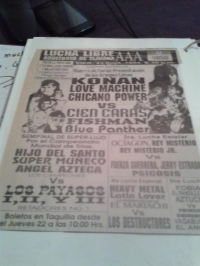 **1/2, Konnan tried to hit Aguayo with knucks, but got Black Cat instead. Title change. Rey Misterio and Vulanco got involved and were fighting on the outside, Lizmark went to help, Parka fouled him and got back in. ** 3/4. ****, 28:42. Blue Panther made the save for the Mexicans after the match. 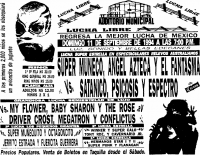 Misterio's mask was on the line. 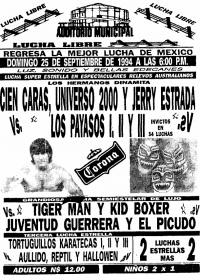 4) Eddy Guerrero, Konnan, Love Machine DQ El Hijo Del Santo, Octagón, Perro Aguayo Sr.
Blue Panther made the save after the match. 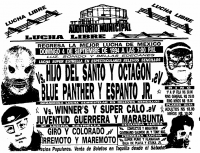 2) Brazo de Oro, Brazo de Plata, El Brazo b Dr. Wagner Jr., El Hijo Del Gladiador, Gran Markus Jr.
Black Cat ran in the match to give Konnan knux, Antonio Pena tried to stop him, and Cat attacked Pena. Police arrested Cat, with the foreign heels vowing to got to the American Embassy to get him out. 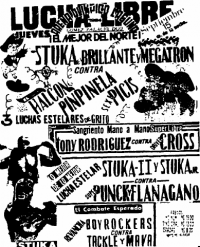 3) Antifaz, Dr. Wagner Jr., MS-1 Jr. b Águila Solitaria, Atlantis, Blue Demon Jr.
2) Hombre Bala, Rey Bucanero, Zandokan II b Gargola El Sultan, Gran Sheik, MS-1 Jr.
2) Silver Line & Stuka vs Mr. Guerrero & Reptil Jr.
1) Corazón Salvaje & Zumbido b El Dorado & Nuevo Huracán Ramírez Jr.
4) Loco Zandokan, MS-1 Jr., Zandokan II b Atlantico, Atlantis, Blue Demon Jr.
3) Américo Rocca, Atlantis, El Dandy b Javier Cruz, Kouki Kitahara, Pierroth Jr. Title defense. 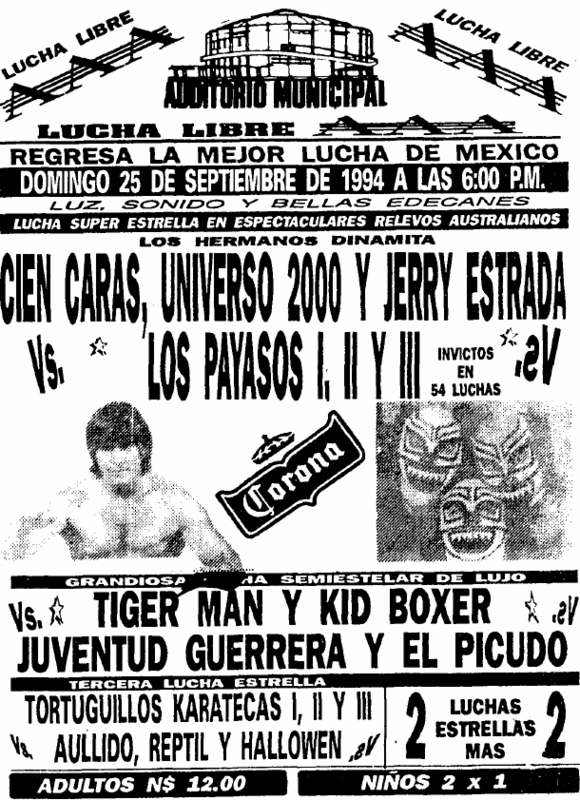 DQ for Vulcano throwing a drink at Misterio, Misterio ducking, and Tirantes taking the drink. 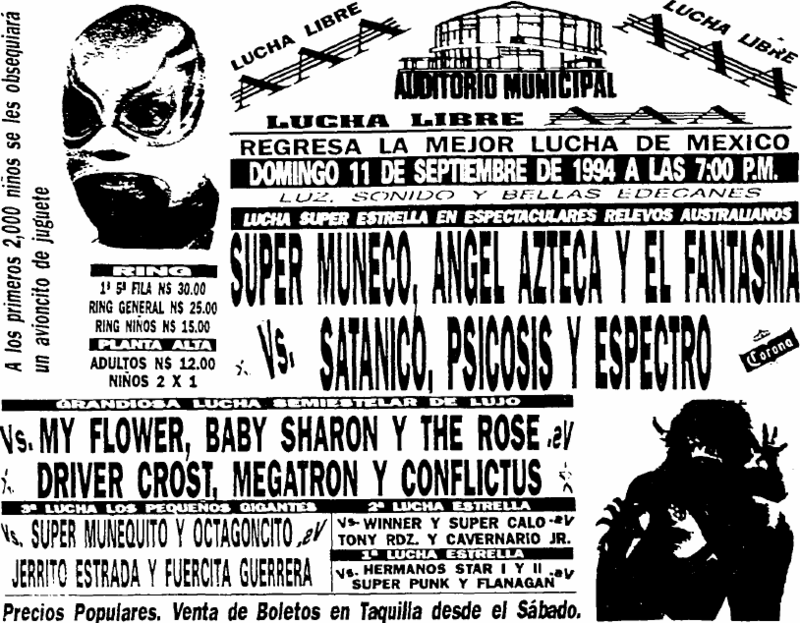 Psicosis took a crazy fall to the floor. 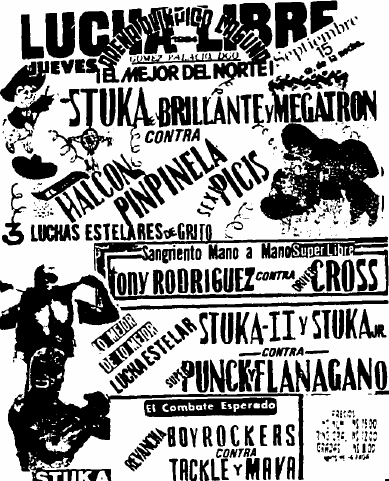 straight falls for the rudos using knux in both falls. 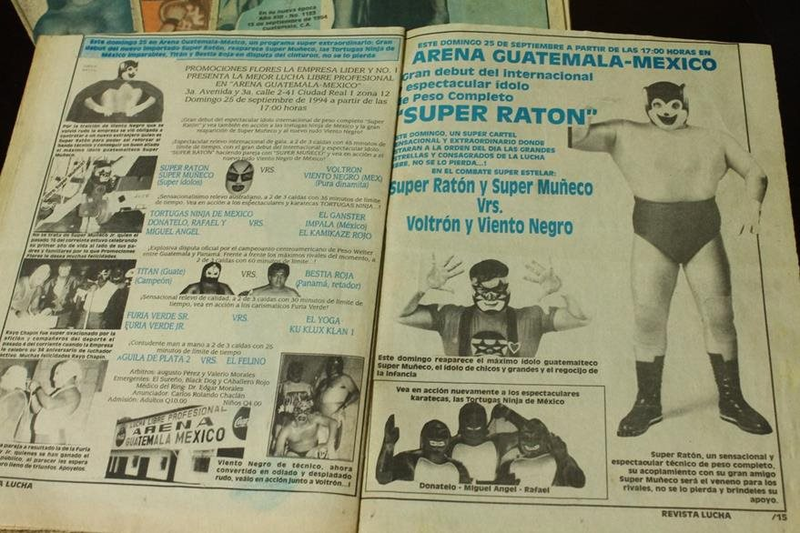 Santo & Octagon made the save. Event Notes: Polo Torres, Joe Marin, El Rebelde, Dr. Wagner, Miguel Vazquez, Espanto III, Fernando Cisneros, Espanto II to be honored. 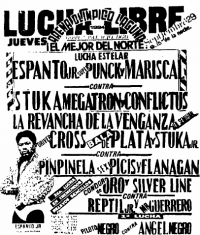 Cibernetico pinned V4. 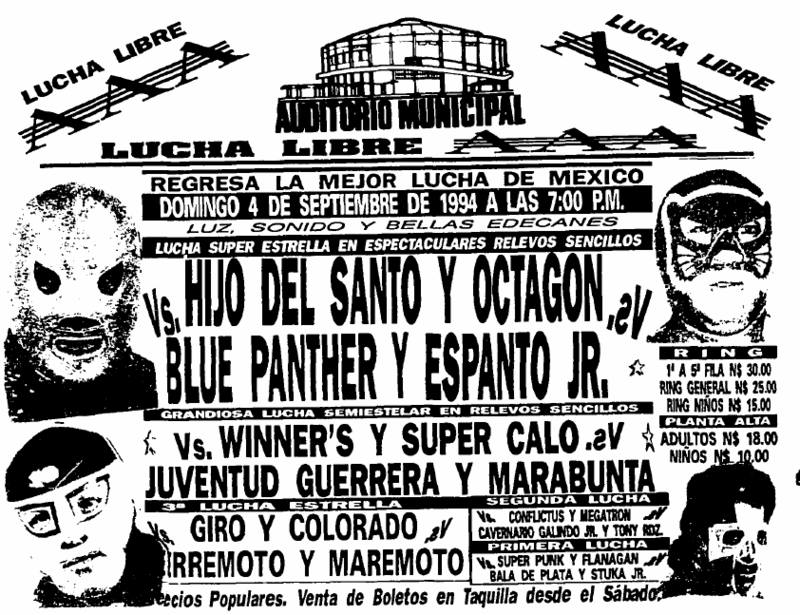 V3 turned on Cibernetico after the match, settingup a singles match. *** 1/32 Arce couldn't continue in the third fall and lost his hair. *** 1/4. 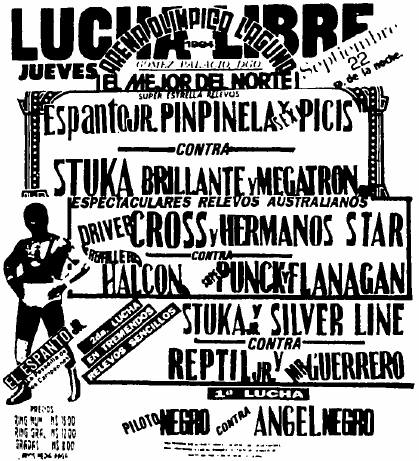 Universo and Tinieblas feuded. 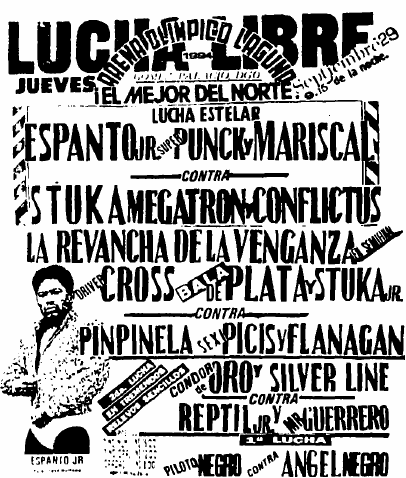 2) Cóndor de Oro & Silver Line vs Mr. Guerrero & Reptil Jr.
Antifaz unmasked as Martin Hernandez, 28. *** 1/4 or * 3/4.